Recent SCIS workshops and presentations have focused on the challenges facing school libraries in their management of digital content. 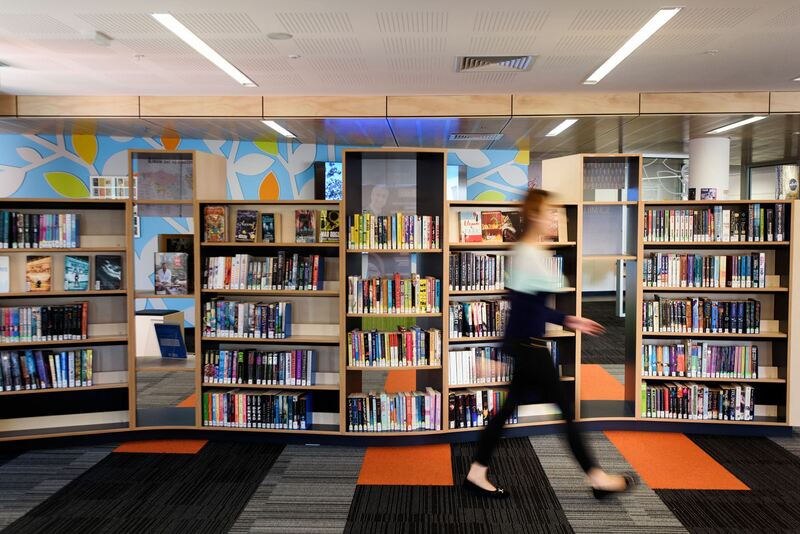 As a key service provider and partner with Australian and New Zealand school libraries SCIS is committed to helping schools deal with collection management issues, and provides catalogue records for e-books, websites, apps, audio books, learning objects and digital video. SCIS, along with the library world globally, is implementing the new Resource Description and Access (RDA) cataloguing standards – the first major change to take place since the Anglo-American Cataloging Rules, second edition (AACR2) were released in 1978. SCIS cataloguers will commence using these standards on 1 July 2013. 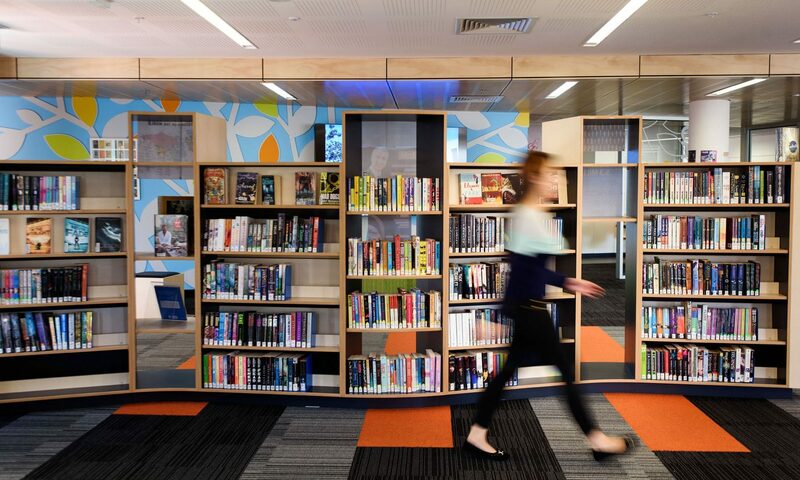 SCIS has consulted with library system providers in Australian and New Zealand school libraries and has decided to move slowly towards full RDA implementation. From 1 July 2013 – 1 July 2014 SCIS will produce hybrid RDA records which continue to use the GMD from AACR2, and which will also retain the 260 Publication field rather than the new 264 field: Production, Publication, Distribution, Manufacture, and Copyright Notice, used by most systems using RDA. The following records have been added to SCIS so library system providers and SCIS subscribers can test any impact of the change in standards on their systems. Please note that ISBNs have been removed from these records so they are not accidentally retrieved through SCISWeb or Z39.50. Normal SCIS records will continue to include the ISBN where available. For a review of what RDA is, and why it is being implemented revisit this compilation of previous Connections articles and blog posts. In Connections 83 (October 2012) we published an article by Renate Beilharz from Box Hill Institute entitled: Why new rules, and what’s it got to do with me? Issue 84 explained How SCIS will implement RDA, and Issue 85 provided more detail on how RDA deals with media types. As part of the SCIS consultation on 4 December 2012 Renate also provided an introduction to RDA and its benefits for education libraries. 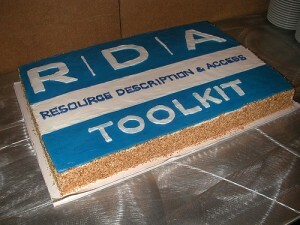 More information about RDA is available on the website of the Australian Committee on Cataloging. Have you checked out the new SCIS Catalogue launched last week? As well as a fresh look, there are a number of features that will be appreciated by SCIS users. The search limits available in previous versions of SCIS OPAC are still available (year, place, type, format and language), but search limits have been supplemented in this version of the Catalogue by the ability to filter the results following your initial search. These filters are found in the right hand column of the search results page. 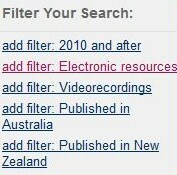 Log in to the SCIS Catalogue and try the filters on a search for World Cup. If you have requests for other filters you would like to see included as default, please let us know. A new timeout countdown feature alerts you if your search session has been idle for some time and is about to be reset. Extension to the timeout period is also being trialled following a server upgrade. The Voyager 7.0 WebVoyáge user interface was developed to comply with international industry accessibility standards. The new SCIS Catalogue is designed to display well and resize for use on various mobile devices. 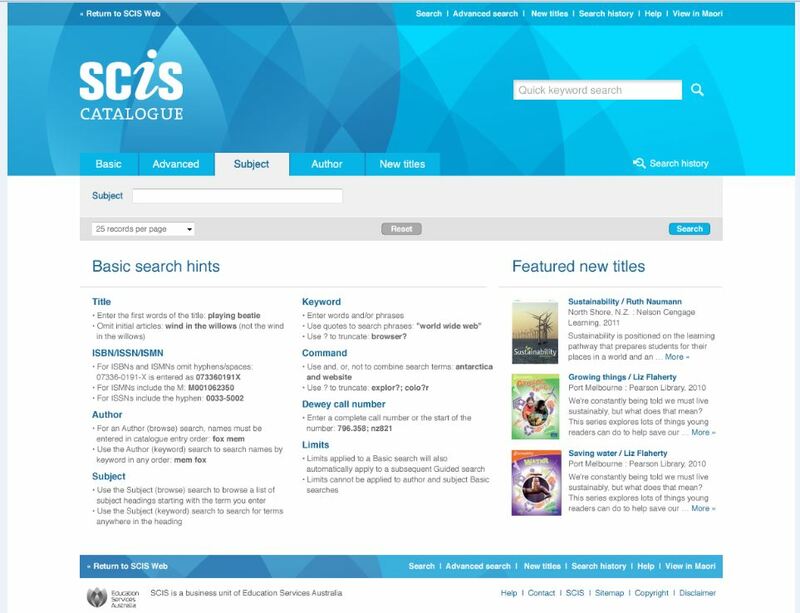 The SCIS Catalogue is now on a separate server at address: http://opac.scis.curriculum.edu.au which means it can function independently in the event of downtime on other SCIS services such as SCISWeb. If your network settings or firewall need to be changed as a result, please contact SCIS for the IP address of this server. 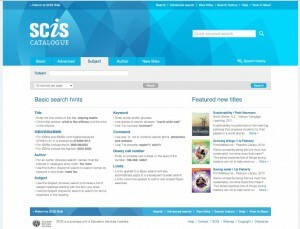 From 3 October 2011 the SCIS catalogue will undergo a major upgrade. We will endeavour to keep disruptions to a minimum during this time. Please ensure you have a valid email address registered with SCIS so that we can keep you informed. Simply log in to SCISWeb, and go to My Profile to add or update your email address.